In his mind’s eye, Jim Reed still pictures his first pocket knife. He sees it so clearly that he almost feels it resting in the palm of his hand. His dad gave him that knife when he was 12, back in 1931. But before he even had a chance to dull the blade, he traded it away to Tom Carnahan. “He wanted this knife of mine. I told him I’d take 65 cents and another knife. I got a cheap knife. I was sick. I got beat out. I got beat bad,” says Reed, 90, a pocket-knife collector who has lived in Woodbury for the past 45 years. 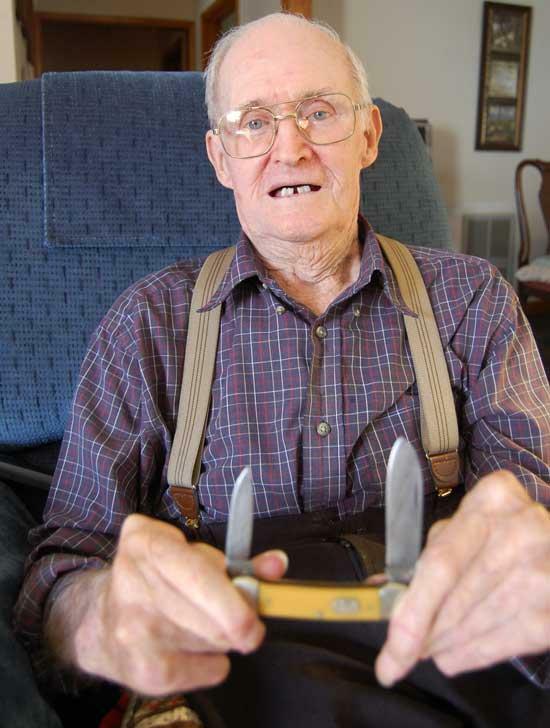 Reed figures that he has made close to a thousand transactions over the past 78 years and he is still trading knives. Within the past few weeks he picked up a two-bladed, German-made boat knife and a three-bladed Bokker. He has kept about 40 of his knives. The collection is safely tucked away in a safety deposit box at the bank. “I’m saving them for my boy,” he says. This morning, Reed wears a shirt, black pants, suspenders, white socks and black shoes as he sits in his easy chair. A wooden walking cane and two Bibles rest nearby at arm’s length. “I like German-made knives and Hen & Rooster. Anything you get out of Germany is always a good knife,” said Reed, who notes that such brands as Boker, Tree, Henckels and Case are knives with reputations as strong as steel. When sizing up a knife, the first two things he looks at are the brand and the handle. Handles can be made of a variety of materials, but stag, bone and pearl handles are highly prized. “If you got a stag knife from Henckels, you got something,” said Reed, whose favorite knife is a four-bladed Hen & Rooster with a mother of pearl handle that he traded for in the 1940s. There was a time when whittlers and knife traders went about their business on the lawn of the Cannon County courthouse, but in more recent decades the knife traders carried out their transactions at the stock barn. “They used to have a pig day on Thursdays and on Mondays they’d sell livestock at the stock barn. I’d go to both of them,” Reed recollected. Nowadays, he conducts most of his trading at home where photos of his wife, son and other family members rest on tables and hang on the wall. Born in the Curlee community, he was a farmer for the first 40 years of his life as he milked cows, sharecropped and plowed with horses and mules. “Last time I made a crop was about 1959,” said Reed, who has suffered from rheumatoid arthritis for the past 50 years. In 1960, the affliction knocked him off his feet. After leaving the farm, Reed worked part time at the courthouse from 1964 to 1972 as property assessor and part time at Bratton-McCrary Drugstore from 1965 to 1980. 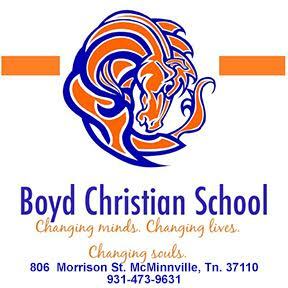 He then labored for five years at Perfect Equipment in Murfreesboro and for six years performed maintenance at Middle Tennessee Christian School. For the past three years Linda Whitlock has been helping him out about the house doing light cleaning and cooking. And he’s even turned her into a knife collector of sorts. These days Reed is pleased to show off a knife made 100% from wood that was a gift from a fellow in Huntsville, Ala. He shares a bit of general information on specific pocket knives. To this day, Reed still pines for that little pocket knife his daddy gave him, the one that Tom Clanahan walked away with. What: The 4,000-square-foot National Knife Museum houses thousands of pieces of exquisite cutlery from around the world. The exhibits are changed periodically to allow the public an opportunity to view all forms of cutlery. Contact writer Ken Beck at kbtag2@gmail.com.